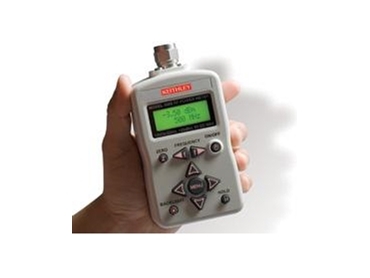 Keithley's Model 3500 Portable RF Power Meter, from Scientific Devices Aust , is a compact, handheld instrument that makes lab quality RF power measurements in both field and R&D laboratory environments. With an absolute accuracy as good as ±0.21dB, a wide frequency range of 10MHz to 6GHz, and a measurement range of -63dBM to +20dBM, the Model 3500 Portable RF Power Meter is suitable for a wide variety of RF measurement applications. Model 3500 Portable RF Power Meter has a built-in power sensor eliminating the need for users to carry both an instrument and a separate sensor module, and the same sensor is used when duplicating tests or measurements for better repeatability. The Model 3500 Portable RF Power Meter fits easily into the user’s hand or a toolkit. An optional belt loop holster or carrying case with shoulder strap is also available. To optimise flexibility, it is capable of drawing operating power from batteries, an AC-DC converter module, or a computer through the USB interface.